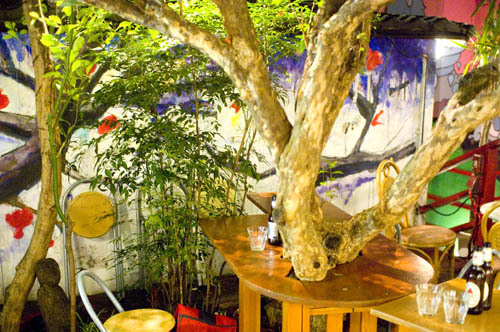 This unusual cafe-bar sits in the courtyard of a very bohemian art-gallery space called Tokyo Design Festa. 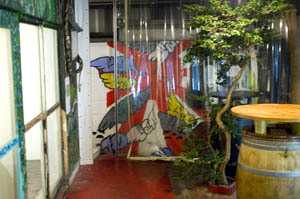 There's a small indoor section where you stand around overturned barrel-tables, and an outdoor portion furnished with normal tables and chairs in the tree-filled garden courtyard. Both sections look onto the gallery's exhibition spaces, so you can enjoy some fresh art along with a bit of nature while you imbibe. Choose from a decent selection of beers from around the world at reasonable prices - just help yourself from the refrigerator and pay at the counter. 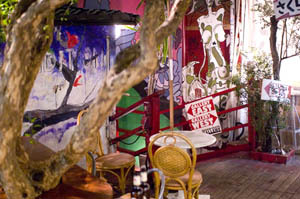 You can also order cocktails or coffee, and there's an eclectic "world food" small-dish menu if you want something to nibble on. Dishes start at Y315, and beers at Y500. Lunch is served 11am-3pm.